Day 11 – Arrived Saladares del Guadalentin, Murcia around 0730, then went through the now usual routine of waking up Paula who was looking very comfortable in the reclined passenger seat. We were hoping the ‘off road’ tracks had dried out and would allow us access to where the Little Bustard are usually found. We had a couple of hours to search as we’d arranged to meet José Manuel Escarabajal nearby at 0930. Either side of the entrance road were winter flocks of Skylark and the usual Crested Lark. At one of the roadside reservoirs we saw trip firsts Common Sandpiper and Little Ringed Plover. Also feeding around the waters edges were Water Pipit, Black winged Stilt and Green Sandpiper. Onto the agricultural tracks, Marsh Harrier, Little Owl, Black Redstart, Meadow Pipit, Stonechat, Magpie, Greenfinch, Kestrel, Chiffchaff, Cattle Egret and a flyover Peregrine Falcon. Whilst scanning for the Bustards, three Black Bellied Sandgrouse flew through our view. The tracks, in areas, were getting wetter and preventing us from entering the fields any further so with our time about up we went to meet Jose. It was decided to have a quick look for the Bustards in his more appropriate Tata Grand Safari vehicle. It wasn’t long till four LITTLE BUSTARD took flight and landed nearby. Three more soon appeared and landed close to the first group. We got close enough for some reasonable photos, saw more Sandgrouse and photographed one of the many Clouded Yellow butterflies that were flitting over the fields. After Coffee near Totana, which Paula enjoyed immensely, we headed to Embalse de Puentes, west of Lorca. 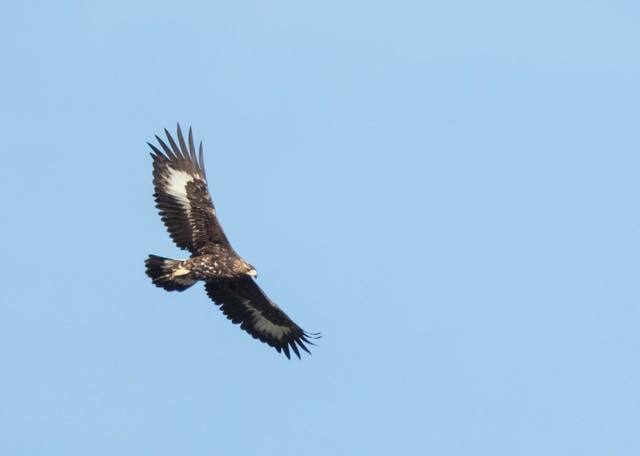 A fab GOLDEN EAGLE drifted over and nearby Blue Rock Thrush, Black Wheatear and Chough were added to the day list. On route to the hoped for Griffon Vulture were tens of Corn Bunting gathered on some roadside wires. We stopped for photos of the stunning landscapes and red skies and arrived at a high dam where on the towering cliffs nearby could be seen the Griffons already at roost. We were too late to see them circling high, but what a fab day we’d had. Bird trip list – 106 species.